In photo: Ms. Maria Elena A. Talingdan (middle) poses with DOST-STII Director Richard P. Burgos (right) and one of the Board of Judges Dr. Maria Theresa H. Velasco as she received her prize and trophy at the PICC center stage, Manila. NRCP Research Information and Dissemination Chief Ms. Maria Elena A. Talingdan bagged the 2018 Outstanding Information Officer Award during the first Bantog: Science for the People Media Awards of the Department of Science and Technology (DOST) on 28 September 2018 at the Philippine International Convention Center, Pasay City. Ms. Talingdan's award was based on her excellent performance, accomplishments and initiatives in information dissemination particularly in print, broadcast, social media presence, and public relations that resulted to huge leaps in the promotion of science and technology to the people. Aside from these, Ms. Talingdan has honed her skills in hosting events and is consistently requested by other agencies for this special task. Other winners for Outstanding Information Officer are Mr. Hans Joshua V. Dantes, Philippine Nuclear Research Institute (DOST-PNRI) and Ms. Sheila Marie S. Claver, Cordillera Administrative Region (DOST-CAR), who got the second and third places, respectively. Likewise, Outstanding Regional Media Practitioner award was given to Sun Star Pampanga's reporter Ian Flora. The awardees of Outstanding Information Officer, Ms. Maria Elena A. Talingdan, 1st place (middle), Hans Joshua V. Dantes, 2nd place (second from left), and Ms. Sheila Marie S. Claver, 3rd place (fourth from left) pose with DOST-STII Director Richard P. Burgos (right) and one of the Board of Judges Dr. Maria Theresa H. Velasco (left). 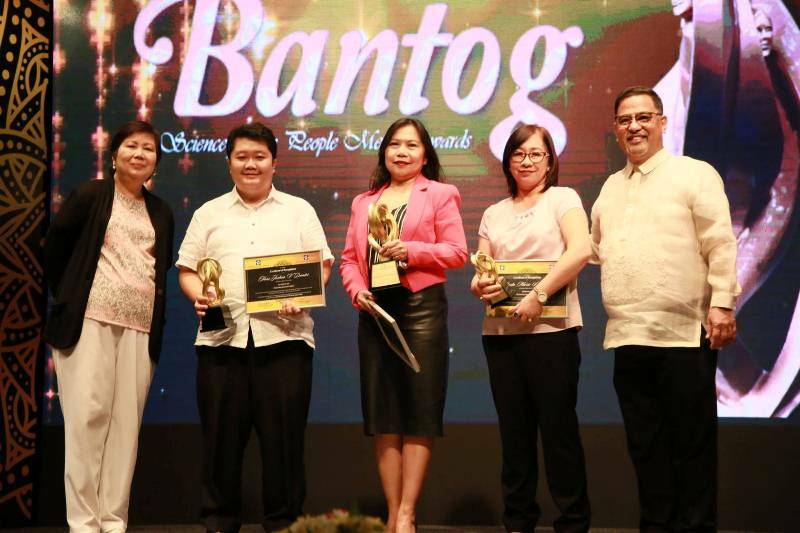 The Bantog Awards is the first event that hails public and private media practitioners in their excellent assistance in promoting S&T programs and projects. The four categories of the Bantog Awards are the Institutional Media Awards, Outstanding S&T Journalist Award, and Outstanding Information Officer Award. Outstanding S&T Institutional Award are given to Business Mirror, DZEC Radyo Agila for Radio, Panahon TV for Television and GMA Social Media Section for the Cyber Press category. As for the Outstanding S&T Professional Media Practitioner Award for Print, Business Mirror's Stephanie Tumampos, Marid Agribusiness Digest's Henrylito Tacio, and Malaya Business Insight's Paul Icamina place first, second, third, respectively. 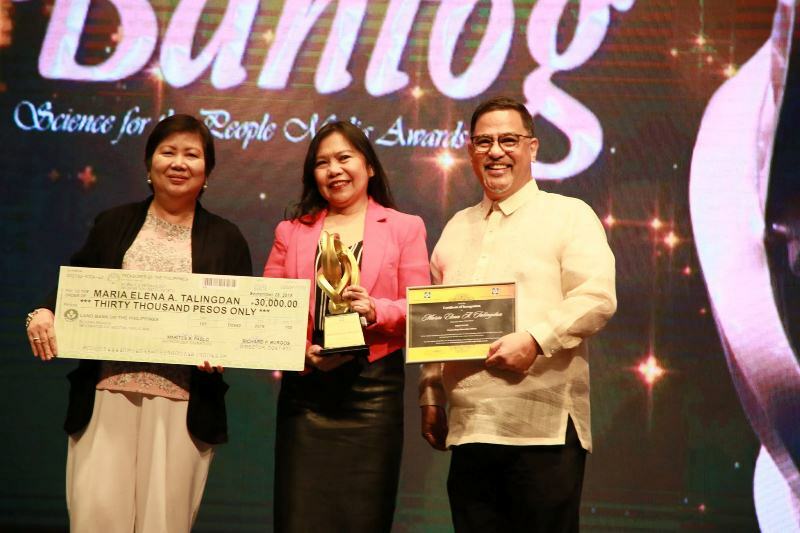 In the Television category, GMA Networks' Connie Sison, ABS-CBN's Bettina Magsaysay and Michael Joe Delizo, also win first, second and third place, respectively. The winners in Radio category are all from DZEC Radyo Agila, Custer C. Deocaris for first place, Josephine D. Agapito for second place, and Anabelle D. Surara for third place. The respective first to third winners in Cyber Press category are Mikael Angelo Francisco of GMA News Online, Ruby Shaira Panela from Rappler, and freelance journalist Angelica Yang. DOST Secretary Fortunato T. de la Peña, DOST-STII Director Richard P. Burgos, and Dr. Maria Theresa H. Velasco pose with the winners of the first DOST Bantog: Science for the People Media Awards.